A mobile-responsive and SEO-friendly job board to help you manage native recruitment advertising with self-serve eCommerce and a powerful content management system. You have to balance advertising revenue goals with protecting your brand and those of your advertisers, dealing with shifting technologies, as well as serving up relevant content to your readership without irritating them. We get it, and we can help. As a publisher who has limited resources to spare, is your solution easy to manage? Yes. Careerleaf’s solution makes it easy to manage job seeker and employer accounts, job feeds, product pricing, and content. 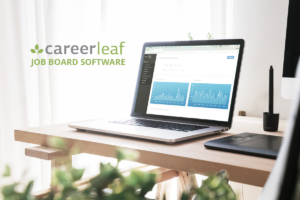 You don’t need a developer or IT specialist to run your Careerleaf-powered job board, and the CMS is powered by the leading CMS on the web making it simple to absorb running the board into your existing content and advertising strategies. Publishers like me are losing revenue on ads – how does a job board solution help? Ad blocking technology is impacting online publishers’ revenue through display advertising, while the online recruiting industry is thriving for those who can boast engaged online communities. Your active readership is a candidate database that recruiters and employers will pay to reach. Learn more about using job posts as native advertising here. How can I convince my organization to invest in a new job board software solution? With our tiered pricing model and resources for managing your board, set predictable revenue goals that will ensure a return on investment and present a solid business case. How can I create a consistent brand experience for my readership and advertisers? With our white label solution, your Careerleaf-powered job board displays your own logo and colours, and you have the ability to create and maintain your own branded content on the board, including feeding your own advertisements or links back to your main web property. Is the money I generate mine or does it go to Careerleaf first? The revenue you generate with your Careerleaf-powered board goes directly to you. I’m used to a revenue-sharing model. Why is this better? After selecting the pricing plan that best suits your needs and setting your minimum revenue targets, your potential for profit is greater with a subscription model. Revenue-sharing models usually work by directing all revenue to the service provider first, then giving 10-40% of the revenue back to you. Some rev-share agreements also require a minimum number of sales, and other companies with this model have recently shut down. We know this model works better for you and us, meaning we both win. If you’re thinking about generating revenue with a job board, or you want to switch to a newer, better solution for managing your recruitment advertising, get in touch with us. You can request more information, a personalized demo, or have us call you for a quick chat.